2lb Block (906g) - As an indication each block is roughly the size of a large block of butter. 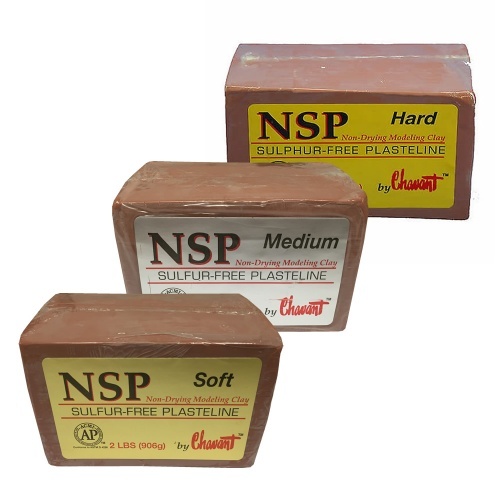 NSP is a sulfur-free, somewhat tougher, waxier, sculpting Plasteline, used widely in Fine Arts and Special Effects. 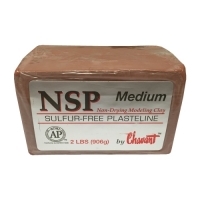 Can be melted and poured at approximately 185º F.
Each type of Chavant Fine Art Sculpting Clay, also known as Plasteline, is suitable for all educational levels and professional sculptors in the Fine Art, Special Effect and Product Design industries. Personal opinion generally dictates choice and clients appreciate the variety of materials. All will meet requirements for detail retention and surface development. Blocks are each individually wrapped. Chavant has an ultra smooth formulation that features a low melt temperature and a low tack feel that will not stick to tools or fingers. 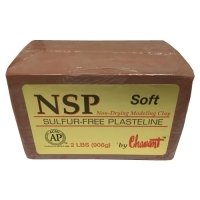 Chavant has high plasticity and has a unique elastic quality much like soft taffy when warm. At average room temperature Chavant is firm enough to capture even the finest details and can be re-used and re-melted indefinitely. Chavant melts easily to a pourable consistency and is great for making copies of life casts where changes are needed. 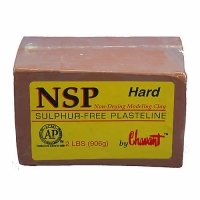 This sulphur free recipe is compatible with platinum silicone moulding compounds. Buy it once and re-use it over and over again. Very firm making it perfect for detail and textures.